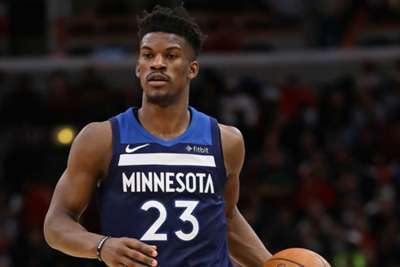 Minnesota Timberwolves head coach Tom Thibodeau expects disgruntled star Jimmy Butler to play their NBA opener against the San Antonio Spurs. All-Star shooting guard Butler demanded a trade earlier this offseason and missed Minnesota's final preseason game on Friday. Butler – who was reportedly close to being dealt to the Miami Heat before the trade collapsed – also challenged staff and team-mates during a tense practice session last week. However, former Chicago Bulls star Butler is set to face the Spurs on Wednesday, according to Thibodeau. When asked if he expected Butler to suit up against San Antonio, Thibodeau said: "Yes." Meanwhile, Butler said on Sunday, "At the end of the day, I just wanna go out there and win basketball games." Butler has been averaging over 15 points per game this preseason, and he averaged 22.2 points per game in 2017-18, but he has made it clear he wants out.